Since 1947, Nabertherm has been manufacturing high quality industrial ovens. The proverbial Nabertherm Quality is known world wide. 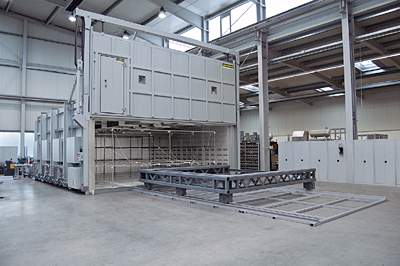 With a team of more than 40 engineers Nabertherm offers a wide range of industrial ovens for all kind of applications. The industrial ovens can be used for drying, ageing, curing and various other applications. Besides industrial ovens Nabertherm of course also offers a wide range of furnaces for termpeatures up to 3000°C. The furnaces and industrial ovens can be used for production with volumes between 100 and 50000 liters. The control system of the industrial oven will be adapted to the individual needs of the operator. In most cases a standard controller is sufficient to cover the needs. Of course it is alos possible to equip the industrial ovens with most sophisticated PLC controls inclusive professional solutions for documentation. If solutions for cleaning the exhaust gases of the industrial oven are required Nabertherm can offer a system which is tailored to the specifications.